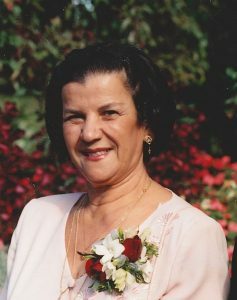 Sofia M. Manolakoudis lost her battle with cancer in her home, surrounded by her loving family, March 19, 2019. Born March 12, 1941, Sofia grew up in Molaoi Lakonia, Greece. Shortly after, her family immigrated to Lansing, Michigan. Their son, Bill, was born in March 1969. They welcomed their daughter, Virginia, to their family in February of 1972. Sofia was a loving wife and mother who devoted her life to her family. Sofia retired from Lansing School District, giving her time to enjoy her flowers, gardening, cooking, as well as baking breads and pastries. Sofia was very talented with her knitting, sewing and crocheting. Sofia is survived by her husband of 50 years, Kosta (Gus) Manolakoudis, son Bill and daughter-in-law Janelle, daughter Virginia (fiance Joe Ballard), granddaughters Mia and Morgan Manolakoudis, sister Helen Kaliyanakis, and many nieces and nephews. A Funeral will be held at 10:00 a.m. on Friday, March 22, 2019, at Holy Trinity Greek Orthodox Church, 1701 East Saginaw St., Lansing. Gus & Sophie were my landlords for 25 years. What wonderful people. I always enjoyed visiting with Sophie. I’m so sorry. I am so sorry to read this. All my love to you and your family during this time Virginia. We are so sorry to hear about the loss of your wife/mother/aunt. You are all in our thoughts and prayers! Keep family and friends close during this difficult time. May she rest in Heaven. Sending prayers of comfort to you Virginia and to the rest of your family as well. Peace and blessings to you all. I am so sorry to hear of your loss. Our thoughts and prayers are with you at this time of sorrow. I am so sorry to hear of your loss, My thoughts and prayers are with you and your family. I enjoyed working with Sophia at North such a nice person . I am sorry to hear about your loss. Sophia & Gus were great landlords to us for many years. I remember Sophia always liked to stop by and chat with my mom and me. May her memory be eternal.